Volunteers from Newfoundland and Labrador served at sea, on land, and in the air during the Second World War. Some defended the home front, others fought on the front lines in Europe, North Africa, and the Far East. Still more worked as merchant mariners transporting much-needed goods to Allied countries, or as loggers supplying timber products vital to the war effort. Members of various charitable voluntary organizations also contributed to the war effort. The Red Cross, the Women's Patriotic Association, for example, provided medical services, meals, and other forms of support to thousands of servicemen and women. Royal Artillery recruits from Newfoundland and Labrador outside the Redford Barracks in Bollington. Photographer unknown. Reproduced by permission of Archives and Special Collections (Coll. 217 3.04.001), Queen Elizabeth II Library, Memorial University of Newfoundland, St. John's, NL. Because the Commission of Government chose to avoid conscription during the war, all of the 22,000 Newfoundlanders and Labradorians who served – and the thousands more who applied, but failed to meet medical or other standards of recruitment – did so willingly. This was a sizable contribution from a small country with a population of only 300,000. While many men and women enlisted to help with the war effort, they also joined to earn military wages, then a rare luxury in a country suffering from widespread poverty. Aside from some 50 Rangers and 260 members of the Newfoundland Constabulary, Newfoundland and Labrador lacked any form of armed forces when war broke out in September 1939. The Royal Newfoundland Regiment, which fought in the First World War, and the Royal Naval Reserve, which trained local fishermen and seamen for service with the Royal Navy, had both disbanded by 1921. Of immediate concern to the Commission of Government was the establishment of a home defence force. In October, it created the Newfoundland Militia, later renamed the Newfoundland Regiment in 1943. Before hostilities ended, the Regiment had enlisted some 1,668 men, whose mission was to guard vulnerable areas in St. John's, Bell Island, Harbour Grace, Bay Roberts, Whitbourne, and St. Lawrence. The Commission also formed Home Guard units in Grand Falls and Corner Brook to defend those towns and their valuable paper mills in the event of attack. Not possessing the financial resources with which to raise and equip ground, air, or naval forces for service overseas – as had been the case with the Royal Newfoundland Regiment during the First World War – the Commission of Government instead allowed Britain and other Allied countries to recruit men and women from Newfoundland and Labrador into their armed forces. 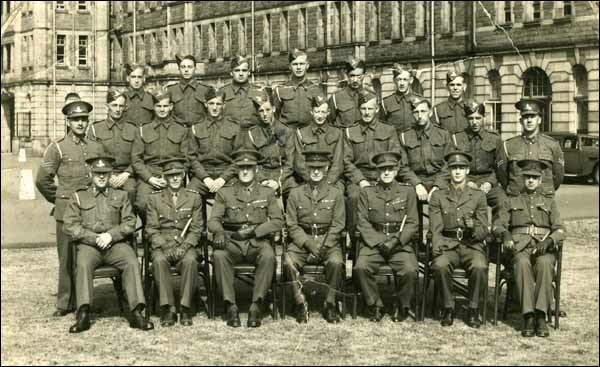 The first draft of recruits left St. John's in November 1939 to serve with the British Royal Navy. By the end of the war, 2,889 Newfoundland and Labrador men had enlisted in the navy, more than in any other single branch of the armed forces. These men were dispersed throughout the navy, where they served on hundreds of vessels in every theatre of war. 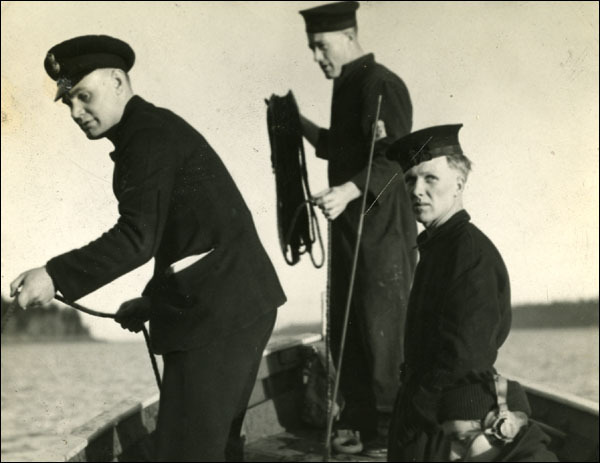 Jim White (right) of Greenspond, Newfoundland and two unidentified naval personnel. Photographer unknown. Reproduced by the permission of the Greenspond Historical Society. In contrast to this was the British Royal Artillery, which grouped all of its recruits from Newfoundland and Labrador into two regiments named for their country. The 166th (Newfoundland) Field Regiment served in Britain, North Africa, and Italy; the 59th (Newfoundland) Heavy Regiment defended England's coastline for three years before fighting in France, Belgium, the Netherlands, and Germany. Before the war ended, some 2,343 Newfoundlanders and Labradorians fought with the Royal Artillery. The youngest of Britain's armed forces, the Royal Air Force, also recruited in Newfoundland and Labrador, though less extensively than either the Navy or Artillery. By 1945, approximately 712 men had departed St. John's to serve as airmen or ground staff. A portion of these helped form the No. 125 (Newfoundland) Squadron, a night fighter unit which patrolled British skies and coastlines for enemy aircraft or naval vessels. Volunteers from Newfoundland and Labrador also served in other Allied forces. Canada, for example, recruited 1,160 men into its navy, army, and air force, while more than 500 women served in the Canadian Women's Army Corps, the Women's Royal Canadian Naval Service, and the Women's Division of the Royal Canadian Air Force. Also serving overseas, but not part of the armed forces, were the thousands of men and women who joined the merchant navy and the Newfoundland Overseas Forestry Unit. Some 10,000 Newfoundland and Labrador merchant mariners helped deliver goods to and from Allied countries aboard non-military vessels. Theirs was essential, yet dangerous work, and before the war ended, German forces sunk more than 5,000 Allied merchant ships and killed at least 333 of Newfoundland's mariners. Scattered throughout the United Kingdom's forests, meanwhile, were the almost 3,600 loggers of the Newfoundland Overseas Forestry Unit. These men supplied wood to help build coal mine frames, telegraph poles, and ships, or to rebuild bombed structures. 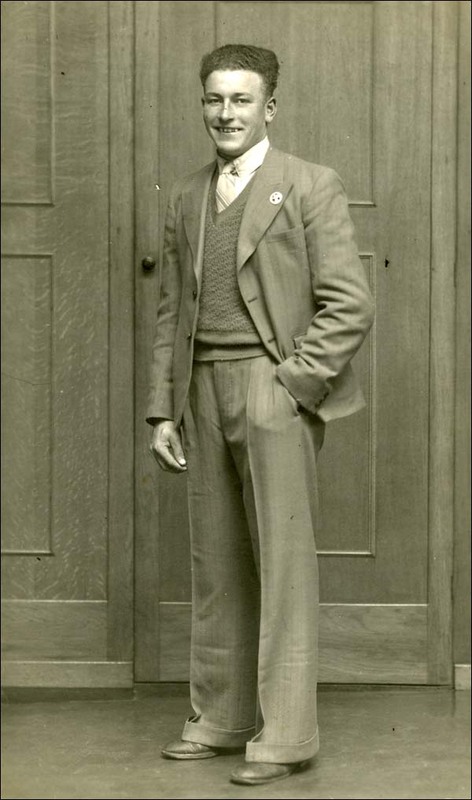 Hector King of Greenspond was one of approximately 3,600 loggers to serve with the Newfoundland Overseas Forestry Unit during the Second World War. In Newfoundland and Labrador, a large civilian volunteer movement supported troops overseas and at home. At the forefront was the Women's Patriotic Association (WPA), which helped provide meals, clothes, and other comforts for servicemen and women. At WPA Headquarters in St. John's, for example, naval recruits could receive free sweaters and other woolens made and donated by women from across the island. The WPA also opened the Caribou Hut in downtown St. John's, which provided accommodation and entertainment for visiting members of the armed forces. Complementing the WPA was the Newfoundland Patriotic Association (also called the Men's Patriotic Association), which helped the Commission recruit volunteers for military service. The Red Cross also did much to provide for the physical and social welfare of servicemen and women. Survivors of torpedoed ships who landed in St. John's frequently received comfort bags from the Red Cross containing razors, shaving soap, brushes, stationary, and other items. In the months following the war, the Royal Artillery and Royal Air Force disbanded their Newfoundland units. Most ground troops, seamen, and airmen had returned home by the end of 1945, while 1,200 loggers remained in the United Kingdom until the following summer. Of the 22,000 volunteers who served, some 1,089 died during the war, and many more were injured. The Commission of Government devised a civil re-establishment program for returning troops, which helped them find new jobs (or return to old ones), paid them a temporary allowance, and provided pensions and medical treatment for disabled veterans no longer able to work. However, the Commission failed to recognize returning loggers and merchant mariners as veterans because they had not served in the armed forces. Only in the year 2000 did the Canadian government make both groups eligible to receive benefits and pensions.